There is something universally familiar about chicken and rice – so many cultures all over the world have some version of it. 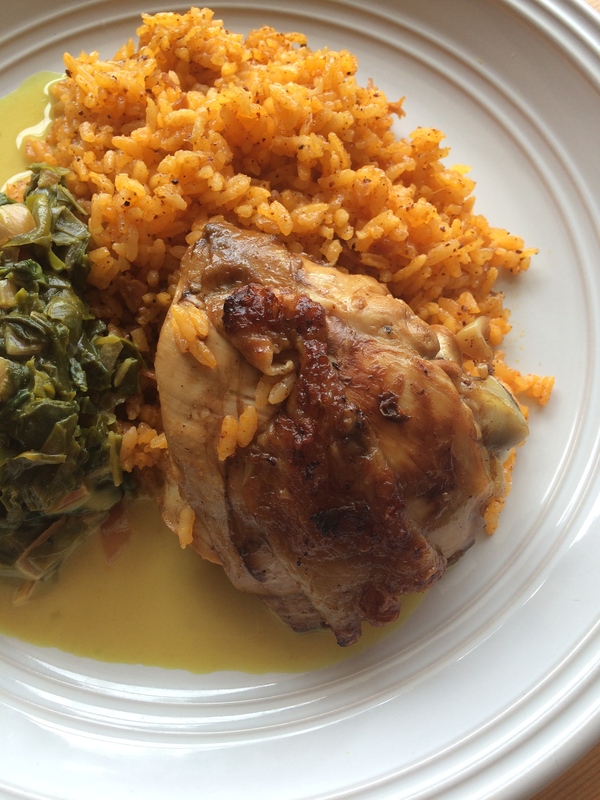 : arroz con pollo (Latin America), chicken adobo (Philippines), oyakodonburi (Japan), Jerk Chicken & Rice (Jamaica), Halal chicken & rice (Middle East), chicken biryani (India) …just to name a few! Not only is this combination satisfying and delicious, but it provides fast energy and a healthy dose of protein all at once. I could (and should) probably do an entire series of posts about chicken & rice all over the world, it would be an entire month’s worth of posts, I’m sure. So…Guam. Spending half of my childhood in Hawaii, we learned all about the islands of the Pacific – including the food of all these island nations. Not many people really know about Guam; it’s a tiny island in Micronesia that is a US Territory. Guam’s cuisine isn’t very well known, so I was inspired to take on this dish when I ran across it in Saveur magazine. I decided to have a little dinner party with some friends who were interested in trying out Guamanian food, which turned out great! I’d never had annatto rice (aka “Red Rice”) before, and it is quite tasty. Try this recipe for an upcoming summer BBQ – definitely a crowd pleaser. Don’t forget the finedene (recipe below)! This chicken recipe from Portland food cart vendor PDX 671 appeared with the story Food of the People in Saveur Magazine. To make the marinade, combine 2 cups soy sauce, vinegar, pepper, sliced onion, and 1 cup water in a large bowl; add chicken and cover bowl with plastic wrap. Refrigerate for at least 8 hours or overnight to marinate. Grill over medium-hot charcoal, or in a cast iron skillet on medium high. Red rice is a staple at any Chamorro meal – it is a perfect complement to barbecued meat. In a large pot with a lid (like a non-stick Dutch oven), heat the oil over medium-high heat. Add the achiote seeds and saute for about five minutes – the oil will take on an orange color. Remove the seeds and discard, then add the onion and saute until soft. Add the Goya seasoning and salt, then the rice, coating the rice with oil. Add the water, turn the heat to high, and bring to a boil. Cover, lower the heat, and let the rice cook for about 15-20 minutes, or until all the liquid is absorbed. This all-purpose sauce has many versions, but its basic framework includes soy sauce, vinegar, chopped onion, and chiles. Simply mix all the ingredients together in a non-reactive bowl, and let it sit in the refrigerator for at least an hour.